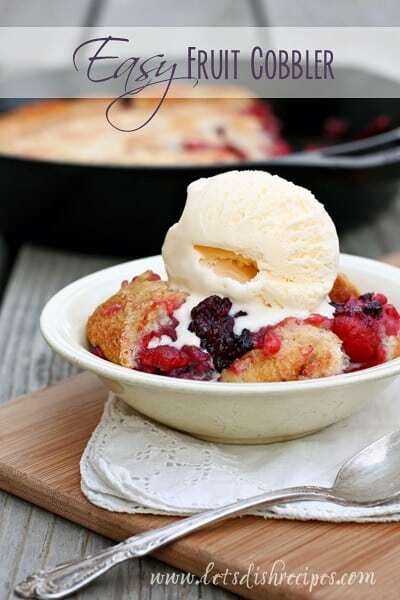 Crisps, crumbles and cobblers are one of my favorite desserts. 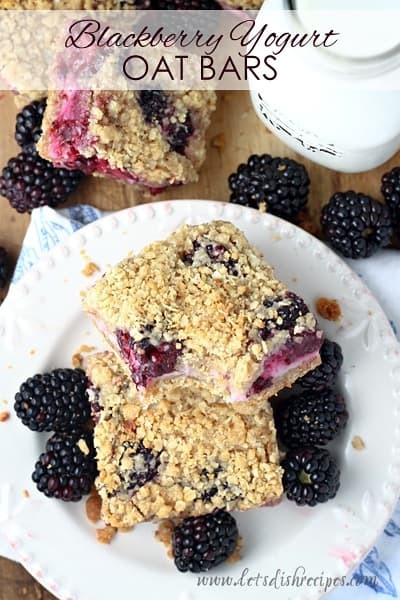 They’re so easy to throw together, and pretty much comfort food in dessert form. And this Strawberry Almond Crisp is no exception! 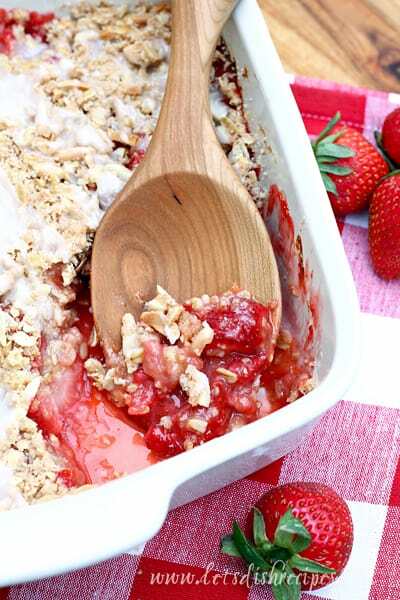 It’s made with fresh strawberries, a crunchy oat and almond topping, and a drizzle of sweet glaze. Topped with a scoop of vanilla ice cream, this easy dessert is perfect for summer. Honestly, this is so easy to put together, it’s practically fool-proof. There is no need to fuss over the recipe at all. It’s meant to look a little rustic. Which means you don’t need to worry about it being perfect. It’s supposed to be messy! I really love the addition of almonds, along with a bit of almond extract in this crisp. It’s a wonderful accompaniment to the strawberries, and adds a little something special. This crisp is pretty delicious on it’s own, warm from the oven, but I highly recommend that scoop of vanilla ice cream. It makes this dessert outstanding! 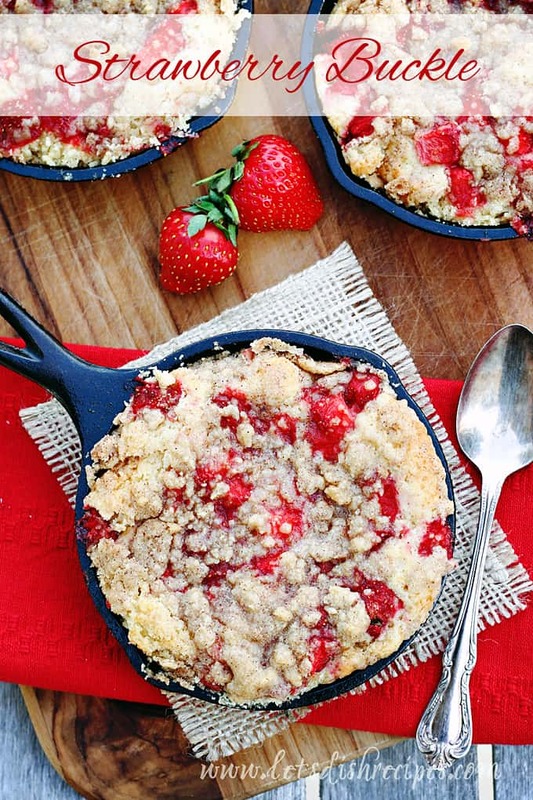 This is a great way to use up strawberries that are a little bit past their prime. And of course, you can always throw some different berries into the mix if you’d like. 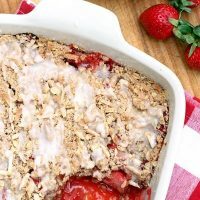 This quick and easy crisp will definitely be a staple around here during strawberry season, and probably year round! My family loved it, and I think it may have disappeared in less time than it took me to make it! Which is always a sign that it’s a keeper! This is one of those recipes I know I’ll be making again and again. 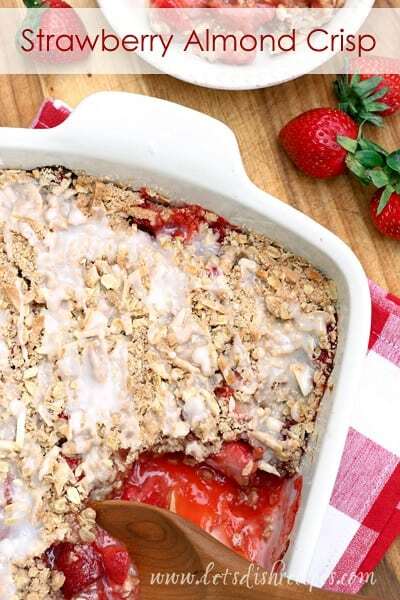 Be sure to save this Strawberry Almond Crisp recipe to your favorite Pinterest board for later. Preheat oven to 375 degrees. Lightly grease 9-inch baking dish. In a medium bowl, toss together the strawberries, lemon juice, cornstarch, sugar and almond extract. Pour into prepared pan. In a small bowl, combine all of the topping ingredients, except for the butter. Cut in the butter with your fingers until the mixture resembles coarse crumbs. Sprinkle the topping over the berries. Bake for 30 to 35 minutes, or until top is golden brown and fruit is bubbling. Remove from oven and let cool for 10-15 minutes. Meanwhile, whisk together the ingredients for the glaze in a small bowl. Drizzle the glaze over the crisp and serve warm, with vanilla ice cream, if desired.